Nice way to keep people talking. I have a few questions and concerns about the casting and age difference between the two leads, Ben Affleck and Rosamund Pike. The first question is one that's been asked before by numerous people regarding the newest Batman. Isn't Ben Affleck too... Ben Affleck to play [insert any leading male role here]? In this case, it's Nick Dunne. 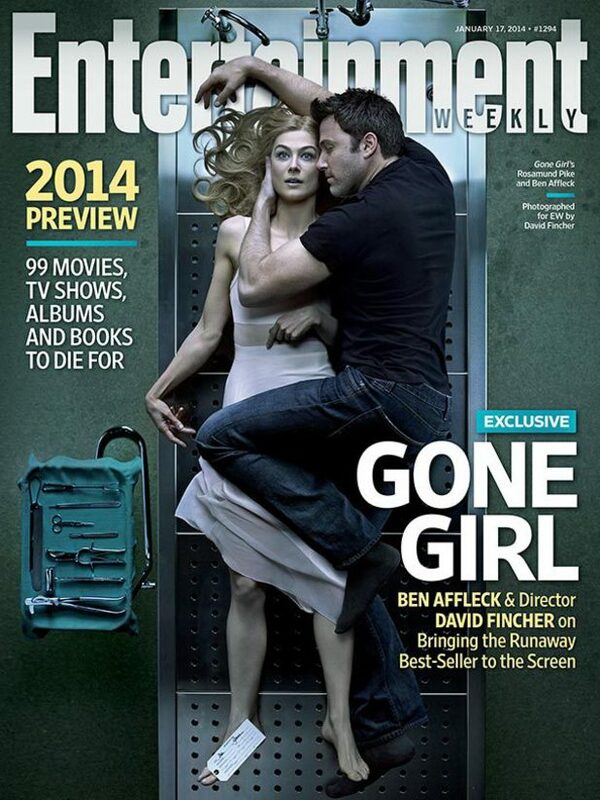 Isn't Rosamund Pike a bit young to play Amy Dunne against Ben Affleck's Nick Dunne? In the book, Nick is 34 and Amy is turning 40. It doesn't say whether or not the age difference is noticeable to other people, but it certainly means a great deal to Amy, both diary-Amy and actual-Amy, because she's always been aware of it. Affleck is 41 and Pike is 34. I recently read EW's "autopsy of a marriage" spread and saw the stills for the first time, and I just don't think David Fincher and Co. will be able to make me believe that there's an age gap between Nick and Amy. Take away the age difference and the depth of Amy's insecurities are lessened, which changes the atmosphere of both the story and the Dunnes' toxic marriage. It wouldn't make the marriage any less toxic, but it might make Nick a more relatable character overall. The reason I think the age difference is important to the story is it's the source of tension between the couple later in their marriage as both spouses gradually drift apart. Also, Nick has an affair with a much younger woman (Andie) whom he sees as the antithesis of Amy in both age and personality. He feels some guilt, but not enough to end the affair prior to Amy's disappearance. Plus, Amy's insecurities about her age is another layer of tension when placed against Nick's affair and the reality of the much younger Andie. I see the years between Nick and Amy as the source of their toxic relationship prior to her disappearance, and I see the years between Nick and Andie as the source of their attraction to each other. And so I don’t think the story would've worked out as well as it did if it'd lacked the age gap between Nick and Amy.